While in Nicaragua in January 2010 working with Vida Joven (Hear their stories), I got to meet the new leaders for Young Life Panama. As I heard their stories of how God is opening the door for Vida Joven Panama, His miraculous provision, and the blessing of others to launch this group, I’m convinced that God is inviting us along side the pioneer leaders to encourage them, help them and pray for them. The three Leaders (center of the photo, with Brenda and our friend Stephanie) are working together in the neighborhoods surrounding Panama Viejo. 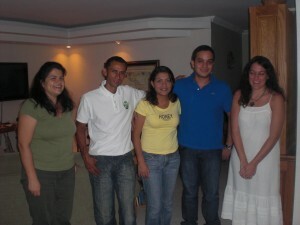 They’ve been involved in leadership training with Young Life to learn its methods and have started their contact work. We listened to their dreams of organizing the first Young Life club, and how they are serving the community surrounding Panama Viejo. It’s all in the launch phase at the moment. Called to Work Along Side. Part of our calling here is to come along side and encourage ministries. These three leaders are pioneering a brand new work, and we get to participate by praying for them and as God opens the doors, providing evangelism training when needed. Each one is a volunteer, and trying to do this on top of full time jobs or full time university studies. They are offering their Saturday’s to spend time with kids at the soccer field, introducing themselves, organizing soccer matches, and inviting people to serve the community. One project they hope to organize is the renovation (painting) of the walls that surround a school soccer field. This is missional outreach. Along the way, these leaders look for opportunities to hear people’s spiritual thirst and talk with them as the Lord leads. It’s not agressive evangelism, but simple contact work and buildling relationships with the community within which they serve. It was a joy to have them at our home for dinner and hear their stories of individuals they contact, and how that will hopefully lead to a club. It’s a joy to come along side and encourage them.